One of the challenges of shooting close-up pictures of small objects is providing even lighting. You can arrange one or two (or even more) lights but might end up with unsightly shadows, harsh illumination, and reflections. There are better ways to create even lighting. Pros use handy setups, called tents, to provide soft, even illumination for their close-up pictures. Tents are exactly what they sound like — tentlike arrangements of translucent material, such as cloth, arranged to cloak your item so that you can illuminate it from all sides through the covering. Just remember to leave a hole big enough for your lens to shoot through! You can make a tent out of clothes hangers, bed sheets, or more elaborate devices. Plastic friction-fit plumbing pipes and joints make a good skeleton for tents of many sizes. You can assemble such a tent and tear it down on a moment’s notice. For small objects, you can make a free-standing tent, such as the one shown, out of a translucent plastic milk bottle. 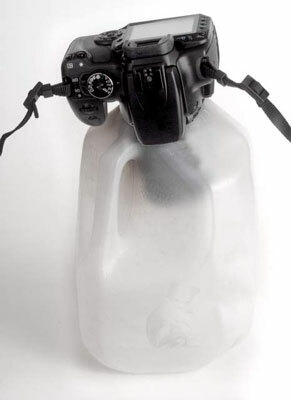 The bottom is cut off so that you can fit the tent over the object being photographed, and the spout and enough plastic has been removed from the neck to insert the dSLR’s macro lens. You can illuminate the milk-bottle tent from all sides and create a soft, even lighting effect, like the one shown.